TDP Special Electromagnetic Spectrum Lamps are often used in hospitals in China to boost the vital energy and stimulate the healing power within the patient. They are also commonly used to help stimulate blood flow to relieve muscular and joint problems such as back pain. My patients tend to find the use of the TDP Lamp as a very pleasant, soothing, relaxing and warming experience. My entire clinic now also incorporates the use of an Infra-Red Heating System which produces a natural uplifting heat similar to the experience attained by lying in the Sun. My clients particularly find this beneficial during the cold and damp months of the Irish Winter. 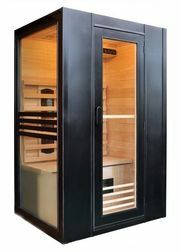 There is also a dedicated therapeutic far-infrared Heat Room in the clinic which can when used give an even stronger boost to the body. Infra-red heat treatments are provided free of charge when you are receiving a treatment such as Acupuncture.